Iceland’s romantic and remarkable European Championship adventure came to an end on Sunday as they came up against the host nation in top form, France running out 5-2 winners after taking a four goal lead by half-time. It was certainly a reality check for Iceland but it was by no means an ugly one - even facing the second 45 minutes with the game effectively over, the Nordic team fought hard, showing their impressive team spirit once again and they were rewarded with two goals and a result which, while comprehensive, was no humiliation. 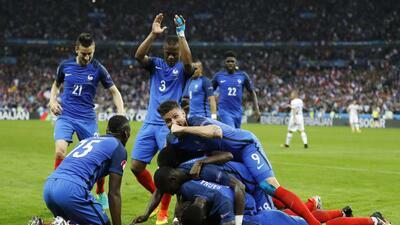 France will now face world champions Germany in Marseille on Thursday for a spot in Sunday’s final. The feeling after this win is that they are doing what the best always do at big tournaments - gradually building up their speed to hit their best when it is most needed. The other semi-final, in Lyon on Wednesday, sees the tournament’s last remaining ‘minnow’, Wales take on Cristiano Ronaldo and Portugal. Iceland head home having made history in this tournament. It was their first ever major international competition and the country of just 320,000 people have firmly placed themselves on the ‘football map’. The mastermind behind Iceland’s climb from soccer obscurity has been Swedish coach Lars Lagerback, who after coaching his own nation and then having a brief spell in charge of Nigeria, set about transforming the approach of the Nordic nation in 2011. Under the calm, studious Lagerback, Iceland reached the qualification playoffs for the 2014 World Cup in Brazil where they lost out to Croatia, but the experience of being so close to their first ever major tournament clearly sparked something. A place in France was secured via an impressive qualifying campaign that saw Lagerback’s team finish above more highly-rated Turkey and the Netherlands. Home and away victories over the Dutch, 2010 World Cup runners-up who did not make it to France, signalled that Iceland were a team to be taken seriously. In the tournament itself, draws with Hungary and Portugal and a victory over Austria secured passage into the last 16 where England found themselves the next victims of the remarkable spirit, unity and organisation of the Icelandic team. In an era where much of the discourse around the game has become dominated by analysis, some would say over-analysis, of systems and formations, there has been a refreshing simplicity to Iceland’s approach. Playing the supposedly ‘old-fashioned’ 4-4-2 formation, Iceland stick to doing the basics very well. They defend in numbers, break on the counter-attack with speed and decisiveness and compete hard in the midfield. That was enough to upset a static and slow England team but the French were a different calibre of opponent and the French showed their superiority from the outset. Olivier Giroud, whose place in the team has been frequently and unjustly questioned, opened the scoring in the 12th minute, rushing on to a through ball from Blaise Matuidi and firing through the legs of Iceland goalkeeper Hannes Thór Halldórsson. Then midfielder Paul Pogba soared above Jón Dadi Bödvarsson’s to power in an Antoine Griezmann corner with a magnificent header. The influential Antonine Griezmann set up Dimitri Payet for the third goal, two minutes before half-time with the midfielder making space for himself before drilling a left-foot drive into the corner of the net. Then Griezmann showed he can finish as well as create as he raced on to a long pass from Giroud and made it 4-0 with a delightful chip over the advancing Halldórsson. If there was a fear that Iceland would collapse in the second half those concerns were quickly answered by the positive and determined way they came out after the break. Gylfi Sigurdsson’s perfect cross from the right in the 56th minute was met by the sliding Kolbeinn Sigthórsson to make it 4-1 but France responded immediately with Giroud getting his second with a fine header from a Payet free-kick that was lofted into the box. France took their foot of the gas a little and while a comeback was not even close to being on the cards, Iceland were clearly intent on going out in the right way. They were rewarded for that approach six minutes from the end when Birkir Bjarnason, one of their finest performers in the tournament, headed in an excellent cross from Ari Skúlason. Then it was time for the fans - with their loud, mass, co-ordinated clapping, giving their team one final show of appreciation to the team. They certainly deserved it.